Funereal, solemn. Commemorative and evocative ethnic flute themes on a rhythmical tympanum. Cheerful, euphoric. Screaming female voices on rhythmical percussion in a ''Bacchanalia'' atmosphere. Bucolic, pastoral. 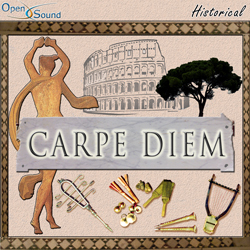 Static intro with evocative themes by ancient roman reeds, then folkloristic flute phrases on rarefied cymbals and rhythmical percussion. Insistent, obsessive. Hypnotic and ceremonial theme by ancient flutes on a rhythmic crescendo.